The annual BOOM! Box Mix Tape is an eclectic collection of stories featuring beloved characters from established BOOM! Box series as well as original stories showcasing up-and-coming creators and brand-new content. 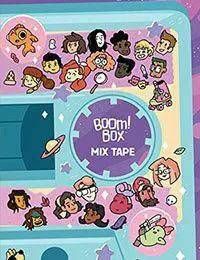 With original stories featuring Lumberjanes, Giant Days, Cyanide &amp; Happiness, Goldie Vance, The Backstagers, and many more! Collects the BOOM! Box Mix Tape 2014, 2015, and 2016.